High strength magnets and improved brush system for superior performance. For generations, the St. Louis Motor has offered a comprehensive introduction to the functions of the electric motor. Now, modern high strength magnets and industrial brush technology have updated this classic apparatus. The open design allows students to identify parts of the motor and investigate function. 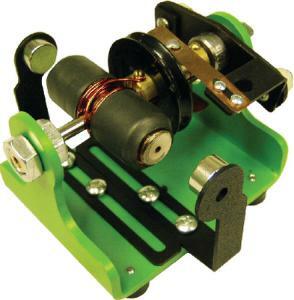 The horizontal axle is mounted on two ball bearings for minimal friction, and the orientation prevents the motor from moving when in operation. An adjustable brush holder allows the commutator to be positioned to give rotation in either direction, and the magnet supports can also be adjusted to vary the strength of the magnetic field. The motor can run on a single battery, from size AA to 9V, however, use of a 3-6V DC power supply allows students to investigate the effect of voltage variation on motor speed. Includes a teacher’s guide with operation instructions and experiments.